Our NZCS Platinum sponsors ARRI would love to have a strong showing of Aussie and Kiwi content in the next ARRI showreel, due to debut on the big screen at NAB in April, and they are asking for our help. They want beautiful, creative and unique content, preferably in 4K or UHD ProRes and DCPs, but they'll accept 1080p files. You'll need to have permission to share the footage for inclusion in the ARRI Showreel. The deadline is the 15th of February but time-conscious submissions will be given priority! The last weekend in October 2017 saw the advent of the first IMAGO International Cinematography Awards. Marc Swadel who represented NZCS reports. The last weekend in October 2017 saw the advent of the first IMAGO International Cinematography Awards. 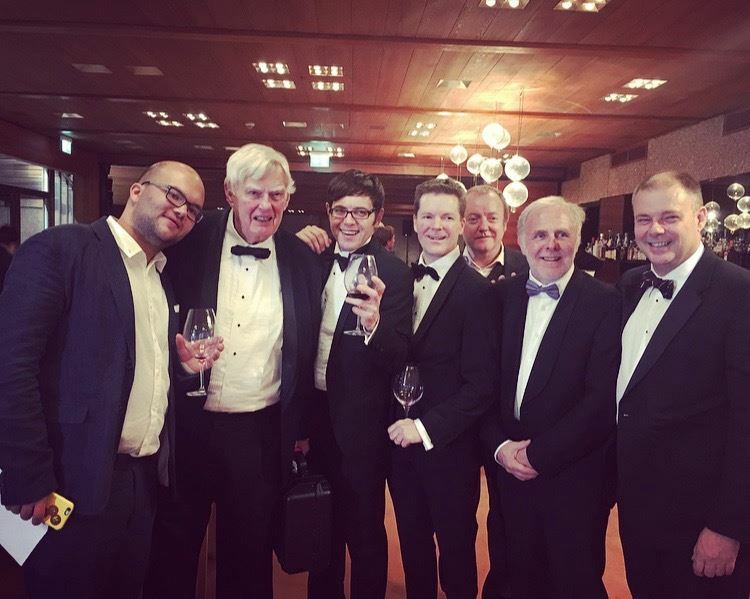 The seeds for this event were sown a year earlier at the IMAGO meeting in Macedonia, where Ron Johanson ACS took up the challenge to head the Awards committee. The idea was Awards by Cinematographers, for Cinematographers – with each society choosing entries for a feature, TV series or documentary. There were also awards for Extraordinary Technical Achievement, Extraordinary contribution to Cinematography, and Lifetime Achievement. It was decided that Helsinki, Finland would be the venue – and it would celebrate not only the first awards – but the 25th Anniversary of IMAGO, the 100th Anniversary of ARRI and the 100th Anniversary of Finland! Fast forward to the 27th of October, as I and my wife Mary are hurtling across Normandy to make our night flight from Paris to Helsinki, leaving a 23 degree, sunny autumnal France to land in a snow sprinkled and decidedly less warm Helsinki. Sharing our ride into the hotel/venue was Fabian Wagner BSC and his partner Lauren, (Pictured left with Marc Swadel and Mary Wing To) and we had a hilarious conversation working each other out – they had come from Dublin, he was BSC, but German, but lived in London, and we had come from Paris, I am with NZCS and ACS, but live in London also. The morning of the Awards, we were all taken on a trip to central Helsinki, and the fortress Island of Suomenlinna. 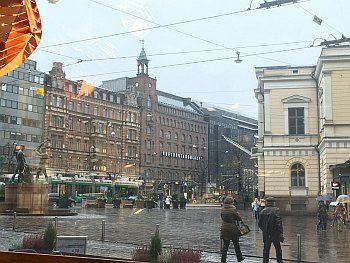 Helsinki is a good looking city – wide roads, trams, and a lovely mix of Art Nouveau and mid-century style. The fortress Island itself reflects Finland’s history – passing from being Swedish, to Russian, then finally into independent Finnish hands. The island is now a UNESCO heritage site, and has art galleries and a recording studio within its grounds. Roll on to the evening – The Awards. They kick off with a black tie drinks and canapes reception, where the cinematographers, sponsors and nominees all catch up, and then we move into the auditorium. The IMAGO Lifetime Achievement Award – was presented by ARRI to Luciano Tovoli AIC ASC. 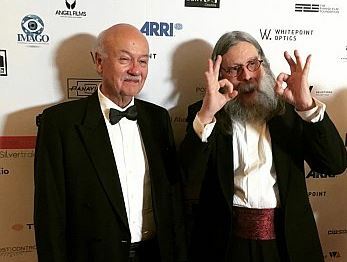 (On right in picture with Daniele Nannuzzi AIC on left ) Luciano is a past president of both IMAGO and the AIC (Autori Italiani della Cinematografia) and some of his best known work is Suspiria with Dario Argento and The Passenger with Michelangelo Antonioni. 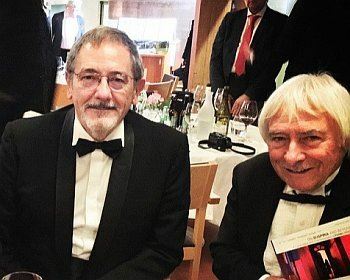 Luciano has been a massive force for both fighting for authorship rights for DP’s and also for fostering connections between us all – having founded IMAGO in 1992. Next up was the ARRI – IMAGO Award for Emerging Cinematographer. This Award went to the young Russian DOP Daniil Fomichev for his work on the dark comedy/crime drama How Viktor Garlic Took Alexey the Stud to the Nursing Home about a 27 year old orphan meeting his disabled father, and the insane mayhem that ensues. 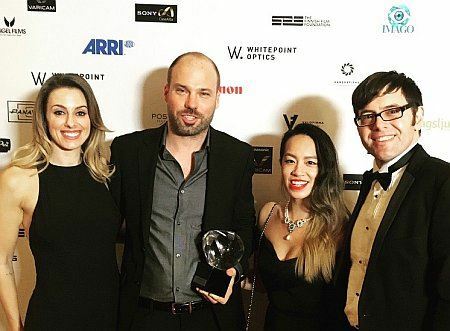 Two more awards came next – both were IMAGO International Awards for Extraordinary Technical Achievement, presented by Angel Film and Dagsljus. First up was Jannicke Mikkelson FNF, who is a 31-year-old Scots/Norwegian 3d/VR expert/DOP/Software Programmer who counts making a VR concert movie with Queen and work with NASA and Sir David Attenborough as among her recent gigs. The other recipient was Joe Dunton M.B.E BSC. Joe is a colossus in camera innovation – he was Stanley Kubrick’s Camera expert, invented super 35mm, the heated eyepiece, the ladderpod, and a forerunner of the Alexa (an ARRI SR with a digital back, in 2002). Joe also lensed Dance Craze the cult 1981 Steadicam/70mm Ska concert film. And he owns Mitchell. Joe says that he sees where the industry is at the moment is exciting, as it is evolving at a fast rate. His current focus is on inventing a 4 colour system – RGBY – as he says that nothing yet can show the true colour of gold. Next up was the IMAGO Extraordinary Contribution to Cinematography Award, presented by CW Sonderoptic to Marek Zydowicz. Marek is the founder of the Camerimage Festival in Poland, which is the biggest cinematography festival in the world, attracting 70,000 people each year. The very first Camerimage Golden Frog Award for best cinematography was given to Stuart Dryburgh for The Piano in 1996. Łukasz Żal is the Oscar nominated DOP for the film Ida (2013). Ikona is a documentary shot within Siberia’s biggest mental institutions, delving into the lives of its inmates. Łukasz relayed the film was shot under limitations – and all he had was a 7D and 24 and 50mm lenses. Fabian is a Munich native, who started his journey at ARRI when he was 16. As well as lensing Game of Thrones, Fabian has shot on over 20 episodic series, as well as features such as Victor Frankenstein and the upcoming Justice League. He is just about to start the 8th series of Game of Thrones. Seamus is a multi-Oscar nominated Northern Irish born DOP whose credits include The War Zone, Fifty Shades of Grey, Godzilla, and Anna Karenina. Nocturnal Animals is a stylish dark drama from designer turned director Tom Ford, mainly shot at night on Kodak stock. And there we had it – the inaugural IMAGO International Cinematography Awards were awarded, but the night was not over – all retired to the dining room where a fantastic Finnish dinner was provided, followed by very good wine, beer and conversations that lasted well into the next morning (they did for me!) On another good note – a gent came up and asked if I was from the NZCS – it was Phil Greenstreet, from Rosco soft drops – who said he enjoyed his time in NZ a few weeks before. It is definitely a small world! In conclusion – a great event. Paul Rene Roestad the IMAGO President can stand proud – Tahvo Hirvonen and the Finnish Society did a wonderful hosting job, and Ron Johanson and the Awards committee, and also the judges should take a bow. As should we all – this was an awards from us to us – 53 societies, 100+ entries and 4000 Cinematographers made this event truly mean something. Paul-Rene Roestad FNF IMAGO President and Tahvo Hirvonen FSC President. Detailing the photochemical workflow that combined cinematographer Hoyte van Hoytema, ASC, NSC, FSF’s 15-perf and 5-perf 65mm film footage into a unified big-screen vision for director Christopher Nolan’s World War II epic. Read more on the American Cinematographer site. AC magazine contributor Benjamin B explains how to understand the attributes of spherical and anamorphic lenses with this new entry in his ongoing series of posts. Read more on the American Cinematographer site. The August 2017 NZCS annual general meeting (AGM) ushered in three new committee members who significantly increase the breadth of experience on the committee and oh, they happen to be women. The new NZCS committee meets for the first time. (LtR) Mark Lapwood, Nina Wells, Murray Milne, Aaron Morton, David Paul, Cushla Lewis, Chloe Smith, Donny Duncan, Donny Duncan. As one of the country's most experienced news and current affairs cinematographers, Cushla Lewis brings a welcome new perspective to the committee, while Chloe Smith, admired for her support of New Zealand crews on overseas productions, brings a wealth of production experience and business expertise. The third new face is Nina Wells whose CV reveals a thoroughly 21st century approach to forging a career as a cinematographer. The August AGM voted in the new NZCS committee along with re-electing President Richard Bluck NZCS and Treasurer/secretary Murray Milne NZCS. Incumbent Vice President Dave Cameron NZCS stood down from the position, and Paul Richards was elected to the position. The full AGM election results are listed below. Chris MacKenzie of Rosco agent PLS, has just confirmed that Rosco is going to sponsor a SoftDrop again this year and NZCS full member Guy Quartermain has agreed to come up with an image. 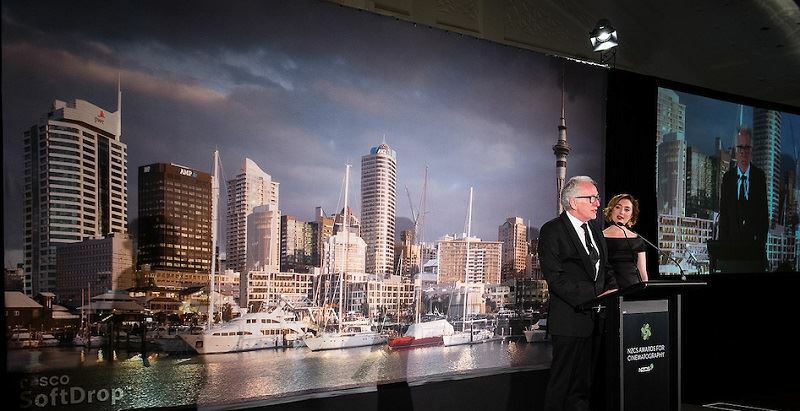 All the awards presentation photos looked great against last year's SoftDrop shot my Murray Milne NZCS, and guests were treated to the full effect when as clips or entries were projected the backdrop instantly transformed to a subdued night scene thanks to a single fader on the PLS lighting desk. Keen to show what this kind of technology can do, Chris McKenzie has suggested a country scene that fades to moonlight and Guy Quartermain has agreed to the challenge. A great example of what members, supporters, and sponsors are doing behind the scenes to make the 2017 NZCS Awards a success. 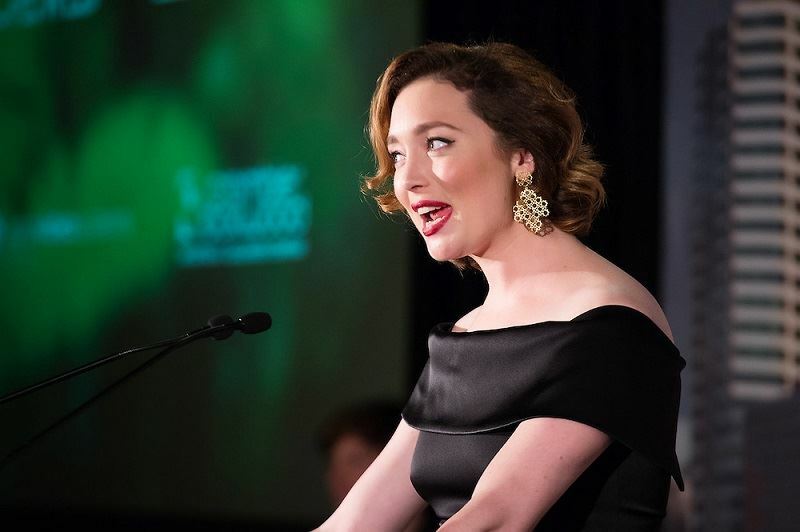 After doing such a fabulous and professional job of MC at last year's NZCS Awards, Antonia Prebble has agreed to a repeat performance. In case you've been under a rock - Antonia is known and loved for her characters like Loretta West in Outrageous Fortune, and the young Rita West in Westside. But it turns out she is an intelligent and accomplished MC that has the talent of making it so exciting and glamorous that you can't wait to see what comes next. This is why is great to have her back - she somehow makes it all fun. 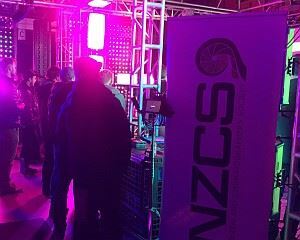 NZCS members and friends were given a glimpse of the future at an event hosted by NZCS platinum sponsor A2Z Technologies in July. Kellie Hiatt from RAW recording and processing specialists Codex headlined the evening on her way back from SMPTE in Sydney to her home base in Los Angeles. A2Z organised a camera scoop with three new cameras on hand to show that RAW capture is now an everyday reality for high-end productions. 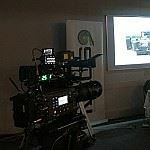 The new Canon C700 and Codex recorder, the Panasonic Varicam Pure, and the latest ARRI Alexa SXTW were kitted out and drew appreciative groups of admirers. And as usual, the technical stuff was book ended by members and friends socialising and catching up with representatives from ARRI, Canon, Pro Video the NZ Panasonic agents. and of course the friendly folks from A2Z Technologies. 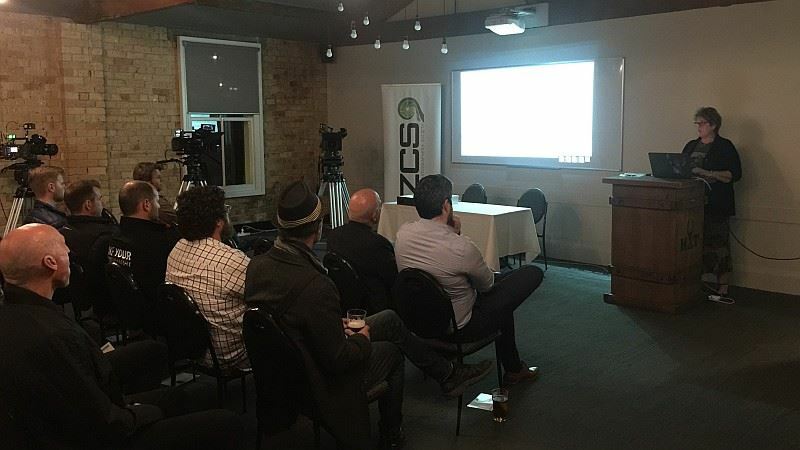 An event in July, hosted jointly by NZCS platinum sponsors ARRI and Xytech Technologies, featured a master class in ARRI SkyPanel cutting edge LED technology. 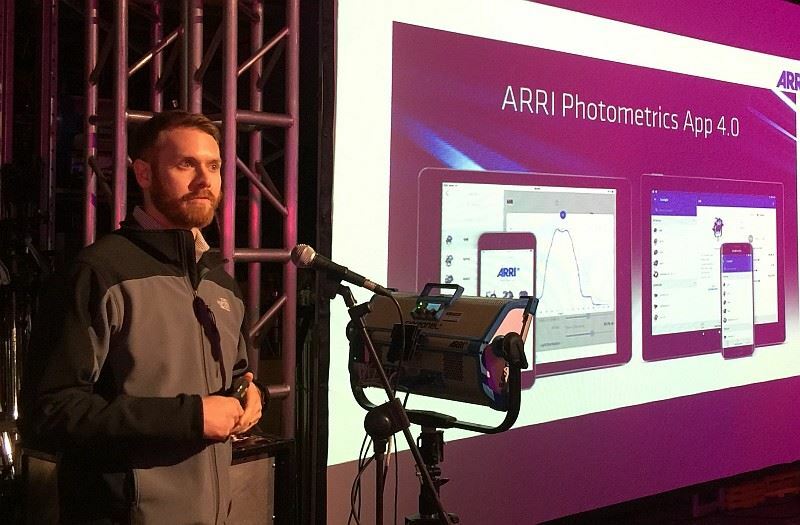 US-based ARRI SkyPanel Product Manager Mike Wagner went into the theory and practicalities of how to exploit the new technology for maximum lighting control, and save time. Although the SkyPanel is not itself new, Wagner explained that they are essentially computers with LED engines attached, so software updates like the recent firmware V3.0 add significant functionality. For example, firmware V3.0 introduced convincing effects like lightning, cop cars, and paparazzi effects all of which are easily altered and cued. Wagner ran through and demonstrated impressive control and communications built into the fixtures, saving the best for last. In the source matching demo he took a simple household compact fluorescent lamp - notoriously hard to colour match - pointed a hand held spectrometer at it, loaded two CIE colour space coordinates into the fixture for a perfect match. The whole process took all of 30 seconds. For fun, he repeated the process with a rose coloured gel on the compact fluorescent lamp. After Wagner’s demonstrations, Xytech’s Stephen Prior surprised the audience by noting hundreds of SkyPanels within Xytech inventory, a build-up that started with Ghost in the Shell. The evening was capped off with leading gaffer Sean O’Neill relating the story of how much his thinking has changed and advanced since his attendance at ARRI’s lighting symposium held earlier this year near Munich.